TODAY IS A HUGE DAY IN MINNESOTA SPORTS! HUGE. HUGE, I TELL YOU! First of all, we're playing the Yankees at home in Target Field. Talk about David vs Goliath, you've got the good old boys facing off against the evil empire. All of downtown Minneapolis seemed to be awash with blues, reds and whites this morning and I'm loving it! Secondly, Randy Moss has been traded from the Patriots back to the Vikings. I am not ashamed to say that I am a fair weather Vikings football fan. There is just too much drama coupled with a history of dashed hopes. I'm pretty sure I can pinpoint my breakaway to 1998's missed field goal attempt by Gary Anderson. Viking's football has just never been the same since. That said, when we picked up Brett Favre last year, I couldn't deny a little bit of excitement, even though it ended just as it always does for the Vikings: a loss. I didn't hold much hope for this season and so far, that feeling has been validated with a 1-2 record . . . but will Moss have the magic? I'm hoping so! Guess who's back? Back again. Moss is back. Tell a friend. With this in mind I shared with a coworker that I can't get Eminem out of my head, before she could respond or I could elaborate my 50 something coworker offered to go down to the convenience store and pick some up for me! It took me a second before I realized she thought I meant that I couldn't get the thought of M&M's out of my head! HA!!!! Thank you for the laugh today!! Have a great day! & Thank you for all of the prayers. You are awesome!! Woot! 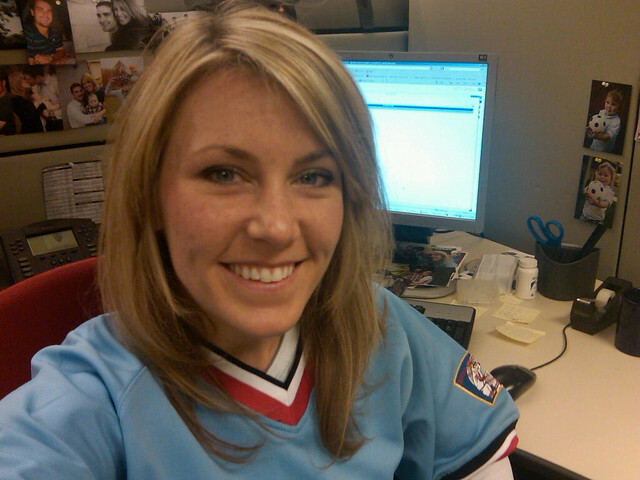 We get to wear Twins gear tomorrow at work. Is it sick that I'm more excited about that, than the Twins rocking the Yankees? I know what you mean about feeling like your team is always losing...I've been a Saints fan since about 8th grade, and they always lost. ALWAYS (not all ways :p ) lost. Last year, they won the Superbowl, and I always get flack about wearing my shirt because people assume I only started liking them last year. GRRR. I would have totally let her buy me M&M's. NOOOOOOOOO - not RANDY MOSS!!!! GIVE HIM BACK!!!!! (lol - sorry I am a diehard PATS fan as I was born and raised in Providence RI). Tom Brady will miss him for sure - but all good things must come to an end. PLEASE tell the Twins to BEAT the YANKEES - please? BTW, Leah - that video you posted? Un-freakin-believeable, I literally cried thru the whole thing. Gina is a master - I wish I coukd hire you both to do a video of us :( I think there are too many miles between Baltimore and you. I just love you little boy's laugh in the beginning. And Tony is seriously HOT - serioously. You guys stop traffic :):) Take it from an aging 51 year old with lines appearing everywhere on her face! Sorry my Yanks beat up on your Twins :( Target field looked beautiful, it's definitely going to have some happy post season memories to come.